Jonathan Alexis moves across one of the obstacle course challenges during the Cleveland qualifier for <em>American Ninja Warrior</em>. The electrical engineering undergraduate student is a finalist, and can be seen competing in the national sporting event on NBC-TV this September. Ninja warriors need to have strength even in their fingertips. 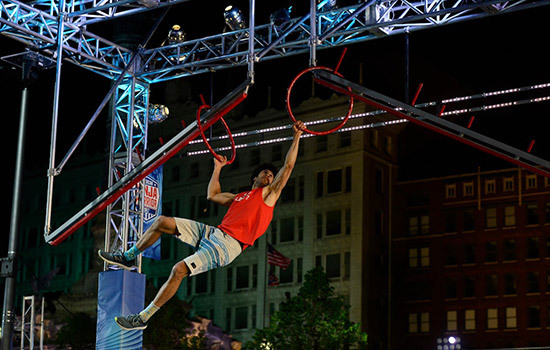 Jonathan Alexis, an electrical engineering student at Rochester Institute of Technology, brings that strength plus speed and a big dose of humor to Season 9 of the acclaimed national competition, American Ninja Warrior. He is a finalist and among a group of competitors on the NBC program that will swing from rings and grips, leaping from platforms and equipment toward a $1 million prize. “It’s a rush. On the course, it’s adrenalin,” said Alexis, from Waterville, Maine, who spent the summer competing in qualifying matches in Cleveland. For the 2017 competition, he was one of 70,000 people who applied for the few coveted spots in regional events. Only 15 competitors from each the regional qualifiers in six U.S. cities go on to the finals in Las Vegas that begin this September. They compete in four stages of rigorous, timed challenges, many modeled after the popular Japanese show Sasuke. Obstacles vary from platform ladders suspended over pools of water that must be scaled using only upper body strength to the final 75-foot rope climb called Mt. Midoriyama that athletes must climb in under 30 seconds. “Competitors do not see the course before they compete. They like to keep us removed from this, but we call ourselves ninjas so we are always peeking,” he said laughing. As an experienced competitor, Alexis participated for the first time in 2015, during Season 7 with his father, Jonathan Alexis Sr.
“It was a blast because our first year we didn’t know too many people, so it was good to have someone with you going through the experience. A big part of my story was how much he was an idol and how I looked up to him in his fitness. He would always coach me in different sports when I was younger and teach me martial arts. It was really cool. He is very fit at 50,” said Alexis, a native of Waterville, Maine. This fall, Alexis is beginning his fifth year in RIT’s Kate Gleason College of Engineering studying robotics. He was a member of the university’s intercollegiate track team and Parkour Club. Parkour is a popular and dynamic training discipline that mixes multiple activities such as running, climbing and balancing challenges similar to a military obstacle course. The American Ninja Warrior competition consists of similar challenges. Alexis has also become more comfortable with the television environment of bright lights and vocal fans at an exciting competition that has more than 6 million viewers a week. At one point during a competition, while wedged between the “I-Beam Gap,” he waved and winked light-heartedly at fans, all captured on one of the overhead cameras. But the American Ninja Warrior competition is as much a personal challenge as it is a physical challenge to Alexis. It aligns with his personal philosophy that individuals are capable of overcoming obstacles through initiative, perseverance and the ability to adapt well. The finals of American Ninja Warrior will air at 8 p.m. on Mondays on NBC beginning Sept. 4.